A senior at La Feria High School, Zabdiel Rothschild understands the importance of working hard, striving for excellence, and maximizing his education. During his first year of high school, he was on the honor roll while participating in band, journalism, and tennis. Zabdiel enjoys playing the saxophone for his school’s band. During his sophomore year, Zabdiel also challenged himself academically, taking two Advanced Placement (AP) exams, and volunteering at the Comisión Estatal Electoral de Nuevo León (CEE) in Mexico where he assisted during elections in the summer. This academic year, Zabdiel along with three other peers at La Feria High School entered the KRGV 5NEWS ABC MASTERMINDS Competition and won their first competition. The MASTERMINDS Competition quizzes high school students from across the Valley in Texas in history, math, English, current events, art, and music. Zabdiel attributes his determination to his mother who inspired him to always to try his best. Leaving Monterrey, Mexico and coming to the United States with his mother and sister at the age of ten was no easy task. Through that experience, Zabdiel realized that his mother chased the American Dream not for her but for him and his sister. He is grateful for his mother’s sacrifices and takes advantage of opportunities that will help him develop his education and support his leadership capabilities. 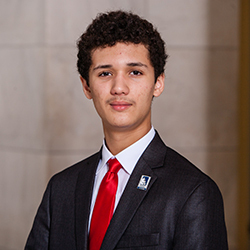 Recently, Zadbiel was selected to represent the United States in Colombia through the State Department Youth Ambassador Program. As a Youth Ambassador, Zadbiel had the opportunity to interact with local governments and civic organizations within Colombia. Zadbiel was one out ten youth who had the opportunity to take part in the three week trip and implement a project that benefited the Colombian community. To support dynamic students like Zabdiel and CHCI’s programs such as R2L NextGen, please visit: www.chci.org/donate.